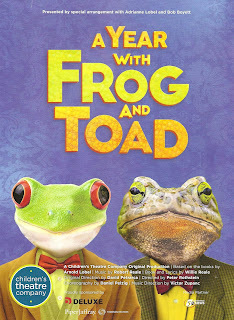 The Tony-nominated musical A Year with Frog and Toad has returned to where it began - the Children's Theatre. It's been back a few times since its brief 2002 Broadway run and subsequent nominations, but this is my first time seeing it. 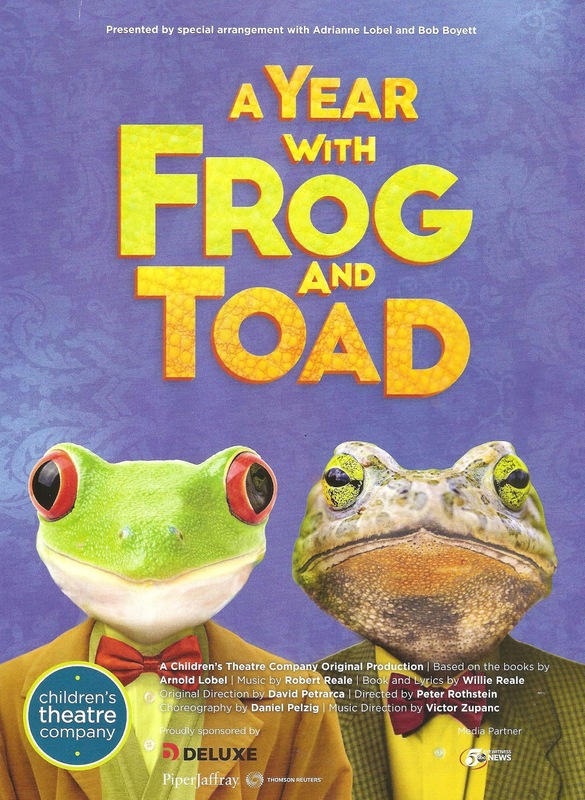 Based on Arnold Lobel's children's books about the friendship between a frog and a toad and commissioned by his daughter Adrianne Lobel, whose original scenic design is used in this production, Frog and Toad is an utterly charming musical. Like many shows at CTC, it's designed with children in mind, but its sweet and simple story is so clearly and entertainingly told that it's a joy for all to behold. The musical begins at the beginning of the year, with Frog and Toad waking from hibernation in April (the chirping frogs in the wetlands behind my house have yet to wake up, they must be sleeping in like Toad). We follow them throughout the course of the year - planting a garden, swimming in the pond (even though "Toad looks funny in a bathing suit"), flying a kite, raking leaves, sledding down a hill. Pretty mild adventures, but done with such a sense of fun and friendship that it's impossible not to be charmed by them. 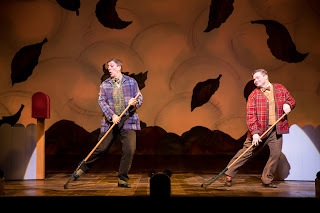 No small part of the charm of Frog and Toad comes from their portrayers - Bradley Greenwald and Reed Sigmund, respectively. One dignified and serious, the other a little bit of a mess, they're very different animals but the best of friends, in an Odd Couple sort of way. Both actors are so wonderful and such a treat to watch. CTC company members Traci Allen Shannon and Autumn Ness, along with Matthew Rubbelke, play multiple animals, including a trio of birds whose coming and going marks the turn of the year, with some yummy three-part harmony. A five-person cast is just the right size for this intimate story; a large ensemble would just overwhelm it. And these five persons in particular are just the right ones. With Peter Rothstein (the best director of "theater musically" in town) at the helm, the show hits just the right tone of humor and sweetness without being sappy, childlike without being childish. The score (by brothers Robert and Willie Reale) is fun and clever and references a range of musical styles, and music director Victor Zumpanc and his small pit orchestra keep it humming along. Daniel Pelzig's choreography is perfectly suited to the music and the story, a highlight being a little leaf-raking soft shoe. Adrianne Lobel's scenic design is quite striking, with many different colorful backdrops and large pieces for the houses and outdoor elements. 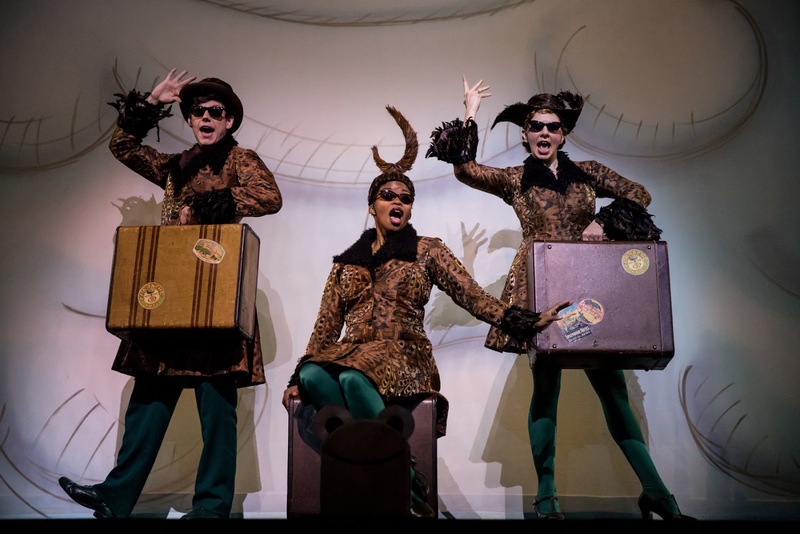 Martin Pakledinaz's playful and colorful costume design keeps Frog and Toad looking like humans, but in their signature green and brown tones, while the other characters have a few more hints at their animal nature - ears or a tail or feathers. Like a year does as we get older, A Year with Frog and Toad zips by and is over before you know it. Clocking in at well under two hours, I would normally be complaining about the intermission. But kids need breaks, and when you throw cookies literally all over the stage (in one of the most delightfully fun moments of the show), an intermission is necessary. These two best friends will be around until June 18. Bring a little one or just go by yourself, as I did, and enjoy the simple beauty and charm of this wonderful show.